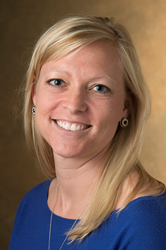 SIUE’s Kelly Gable, PharmD, has been appointed as a specialist member to the Board of Pharmacy Specialties (BPS) Council on Psychiatric Pharmacy. She was the first psychiatric pharmacist to be granted provider status by the Missouri Department of Mental Health in 2014. Kelly Gable, associate professor of pharmacy practice in the SIUE School of Pharmacy. Dr. Gable ... has always been an innovator, and she will be an asset to the BPS Council. Southern Illinois University Edwardsville’s Kelly Gable, PharmD, has been appointed as a specialist member to the Board of Pharmacy Specialties (BPS) Council on Psychiatric Pharmacy. Gable is an associate professor in the SIUE School of Pharmacy’s (SOP) Department of Pharmacy Practice. Gable was the first psychiatric pharmacist to be granted provider status by the Missouri Department of Mental Health in 2014. At that time, she was the only pharmacist in Missouri authorized to function as a psychiatric provider on community mental health teams. “Becoming board certified in psychiatric pharmacy has been incredibly valuable throughout my career, and it is truly an honor to be viewed as knowledgeable, skillful and experienced enough to serve on the specialty council within Psychiatric Pharmacy,” Gable said. BPS was established in 1976 as an autonomous division of the American Pharmacists Association (APhA). The BPS mission is to improve patient care and increase awareness of the need for BPS Board Certified Pharmacists as integral members of multidisciplinary healthcare teams through recognition and promotion of specialized training, knowledge, and skills in pharmacy and specialty board certification and recertification of pharmacists throughout the world. The BPS Board Certified Psychiatric Pharmacist (BCPP) program is a credential for pharmacists who have met the necessary eligibility criteria and who provide person-centered care that ensures the safe, appropriate, evidence-based and cost-effective use of medications in the treatment of persons with mental illness. Educating patients, healthcare professionals and other stakeholders. Gable was the recipient of the annual SIUE Teaching Excellence Award for tenure-track faculty in 2014. It is the most prestigious teaching award that a faculty member can receive at SIUE. Today’s pharmacists improve patients’ lives through the medication and education they provide. Dedicated to developing a community of caring pharmacists, the SIUE School of Pharmacy curriculum is nationally recognized as a model that offers students a unique combination of classroom education, research, community service and patient care. The School of Pharmacy’s areas of excellence include a drug design and discovery core; pediatric practice; chronic pain research and practice; and diabetes research and practice. As the only downstate Illinois pharmacy doctorate program, the SIUE School of Pharmacy is addressing the growing need for highly trained pharmacists in a rapidly growing field.